How to remove glitter nailpolish | Memorable Days : Beauty Blog - Korean Beauty, European, American Product Reviews. I've done a few nail art tutorials where I used a glitter nail polish. Some glitter nail polishes are extremely hard to remove. In this picture you see the Christmas party nail art, click here for the tutorial: http://www.memorable-days.net/2010/12/christmas-party-nail-art-tutorial.html. 1.) The first method is to use a piece of felt. Put some nail polish remover on it, press the piece of felt against your nail for 5-10 seconds and rub the nail polish off. Then repeat the rest of the fingers. 2.) The second method is to use foil and cotton pads. Soak some nail polish remover on the cotton pads. Put it against your nails. Wrap the foil over it and leave it for 4-5 minutes. I tried both methods before and both worked. However, I don't prefer the second method, because it will dry out your skin. Besides, you will waste lots of cotton pads when you use this method. Therefore, I recommend the first method. 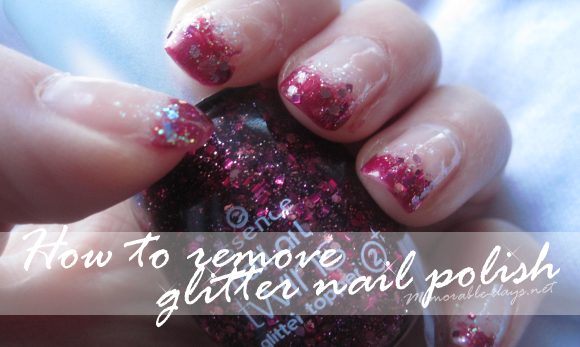 Which method do you use to remove glitter nail polish? Ik heb ook geen vilt thuis. omg this is so useful! I'm wearing glitter nails now! Ik kende beide al, al heb ik geen vilt! Enneh over de begin-comments: Lemony Flutter is a holy grail <3 En heb hem nog niet eens een week!